The Xsheet view has a Column List section that displays all the columns contained in the exposure sheet. It can be used to hide individual columns. If you need to see a column after it has been hidden, you can display it directly from the Xsheet view without using the Column List section. You can also hide a column type, such as Drawing or Sound. When you do this, its corresponding layer is disabled in the Timeline view. In the Xsheet toolbar, click the Show Column List button. On the right side of the Functions section, click the Expand button to display the Column List section. ‣ In the Column List section, select the columns to display and deselect the columns to hide. ‣ In the Xsheet toolbar, click the Hide Selected Column button (you may have to customize the toolbar to display it). ‣ Click the thick grey line that represents a hidden column. 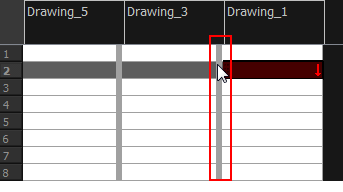 ‣ Right-click on the column header and select Show Hidden Columns. ‣ Press Alt + Shift + H.
The Show Hidden Columns dialog box opens. In the Show column, select the hidden columns you want to display in the Xsheet view. ‣ Click Check to select all the selected columns. ‣ Click Uncheck to deselect all selected columns. 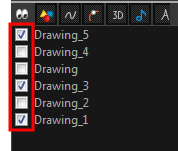 ‣ In the Xsheet menu, select View > Unhide All Columns. In the Xsheet view, select View > Column Types Manager. The Column Types dialog box opens. Select the types of columns you want to display and disable the ones you want to hide. 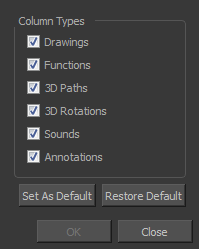 Click Set As Default if you want to make these new settings the default ones used each time you start Harmony. Click Restore Default if you want to return the settings to their defaults. 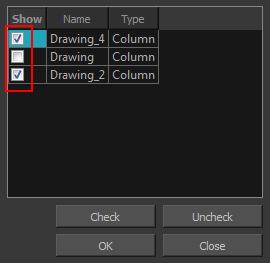 In the Column List section, select the columns to display and deselect the columns to hide.